BJP Prime Ministerial candidate and Gujarat Chief Minister Narendra Modi during a rally in Palampur of Himachal Pradesh on April 29, 2014. 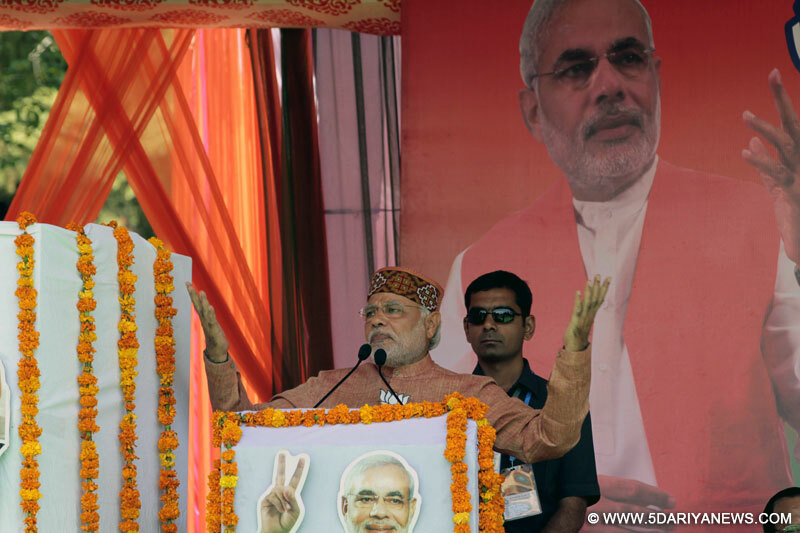 BJP leader Narendra Modi Tuesday made a passionate appeal to voters here to extend support to him by ensuring victory on 300 Lok Sabha seats.Modi, at his first election rally in this town of Kangra district, said: "The Congress is a party that betrays people. It is a 'dhokhe baaz' (betrayal) party. "He described the Congress manifesto as a fraudulent document. "Yeh Congress ka ghoshna patra nahin, dhokha patra hain (This is not Congress manifesto but a fraudulent document)," he said.Donning a Himachali cap, Modi appealed to the voters to "give us 300 lotuses and we will give India a strong government". He played an emotion card with the people of Himachal Pradesh by narrating Kargil martyr Capt Vikram Batra's slogan "Yeh Dil Mange More" thrice in his half-hour-long speech.Capt Batra, who died in the Tiger Hill in the Kaksar sector of Jammu and Kashmir in the 1999 Kargil War with Pakistan, belonged to this town and his mother Kamal Kanta Batra is the Aam Aadmi Party candidate from the Hamirpur constituency. "See how the Congress has misled the servicemen over 'one rank, one pension'. They have been doing it for the past so many elections," he said. "When we take the name of Major Somnath Sharma (the first recipient of the Param Vir Chakra, the highest Indian gallantry award, awarded posthumously for his bravery in the November 1947 Kashmir operations) and Vikram Batra, we feel proud. Our mind says: 'Yeh Dil Mange More'. "Appealing to voters in the age of 18 to 28, the BJP's prime ministerial candidate promised: "We will fulfil your dreams ... broken in the last decade. ""You have given 60 years to the rulers in the country, you give just 60 months to this worker. Yeh dil mange 60 months. ""The PM (prime minister) says money does not grow on trees, but in the orchard of one man not apples but money grew. We need to free nation from corruption," he said without referring to Congress leader and state Chief Minister Virbhadra Singh. Going down memory lane, Modi said: "I have spent years here (in Himachal Pradesh) and spent time with leaders such as Shanta Kumarji. They have taught me a lot," he said.Two-time chief minister Shanta Kumar is the BJP candidate from the Kangra seat. "When the new government is made, once again people of Himachal Pradesh will say this government is ours. When Atalji became PM (prime minister), then Himachal Pradesh would proudly say that Atalji is from our state, his second home is here," Modi said.A total of 38 candidates are in the fray for the four Lok Sabha seats from the state that will go to polls May 7.